To Replace my current Bluetooth unit, that also has FM radio, for use when I am commuting. Love this thing. I recommend to all my friends. I don't expect to be in groups much, wanted FM radio and standard bluetooth access to my music and phone. These are low cost and still allow me to intercomm with just about anyone with the universal intercom. Better speakers and the FM feature made this my choice to get started w/ Bluetooth on my bike. 1st attempt at 2 wheel comm. I have one and it is dying. However, the unit is very good. Lots of vale for the money. My son has this bluetooth set and loves it! So, I purchased the same one for his dad to use while riding his motorcycle. A friend of mine has one of these and after using it I want one. Reasonable price for basic Bluetooth device. Looking to listen music during a long trip or whenever. This product also have very high recommendations from other buyers. I typically ride on my own. All I need is Bluetooth for music and phone, so I went with a simple set. Maybe it doesn't have all the bells and whistles, but it does everything I need it to and is very reasonably priced. bluetooth call function and FM radio tuner, The radio tuner was the selling point over the smh10, Also the price you were offering here was better than SENA direct. Needed one and after checking around saw that Sena was one of the better ones around. And that you had the best price. To communicate with pax or other rider. Calls/music and possibly rider talk with friends. This is a great product. Upgrading to a Schuberth so sad to see it go as I want the Schubert intercom. Loved this device and the fm was pretty dang good! I bought this for my wife. It seems easier to use than my SMH-10R and I don't need it to be as powerful, since she'll be riding with me. Need some tunes while I ride...nice to know when somebody is trying to call you too. I have a Sena 3s and it is a great little unit. I upgraded helmets and because the 3s has the bluetooth built into the speakers instead of a clip on unit, I found that the speakers were too thick for my new helmet (scorpion evo). The smh5 gets good reviews, and although the smh10 is probably a superior unit, I could not justify the difference in cost. No one else that I ride with uses similar units, so the intercom range is not a factor for me. FM tuner and Bluetooth for my phone at a great price. Price on sale, FM tuner. Has all the features I need at this time. It looks like it's supposed to fit the helmet I'm getting and the reviews both video and written got me sold on this one. I wanted to be able to answer calls and listen to music/gps while on my daily commute. FM feature works great, pairs easily, great call clarity and decent volume. Looking for FM radio without wires. Have the SENA SMH10 units already but wanted to add FM. Even though this is s "5" unit and doesn't have some things the 10 has, I found the newer technology ( over my 2 year old 10's ) had improved the volume and sound quality quite a bit. So much so that I don't use the 10 for my helmet even though the new BMW has FM bluetooth built in. Battery life is a bit less than the 10, about 8 hours continuous riding at most. To be able to answer phone calls and listen to the radio on my daily commute. Does this unit have a detachable mic? I will be using it primarily for music use and will probably never use the mic feature. BEST ANSWER: It's hard for me to disassemble the helmet to check if the mic is detachable or not however after looking at Sena's website the mic is detachable. I can't post the link here as this website does not allow posting links but you can certainly check Sena's website. Yeah the mic is detachable. It looks like you can skip connecting if altogether. The wired mic that come with it is really unobtrusive, though. I have a HJC max bluetooth ready helmet, will this device fit? before i order the product it comes with speakers and charger? BEST ANSWER: I'm not sure if it will fit into the recess on the helmet, you may need to use the tape or clamp instead. The unit comes with a USB power/data cable though I cannot remember if it came with the wall plug for the cable (any USB wall plug works). Speakers are included and this unit (SMH5-FM) does have an FM Tuner so you can seek and program stations from the unit itself or preprogram them using the device manager available as a download from Sena. I do not know if this will sync with your bluetooth ready helmet but it does come with speakers and FM stations. I can't say for sure about the helmet, but yes it comes with speakers which just stick to the fabric helmet liner like velcro. It charges with a standard micro USB cable, the same as every non-iPhone cell phone. Yes it receives FM radio stations just fine, I set the presets using the computer software rather than the special combo of button presses to do it with the headset. My buddy I both have a 20S. If we create a group using the 20S and say the 20S' are intercom 1 and 2 then add two a SMH5s to the group as intercom 3 and 4, will the SMH5 be able to hear everyone on the group intercom controlled by the 20S or will the 20S have to select intercom 3 and 4 each time they want to talk to the SMH5s? No, the SMH5 can only hear 1 person at a time and has to toggle between them. How water resistant is the device? Can I use it while raining without any problem? BEST ANSWER: I had mine on when I rode through several massive downpours back East that were enough to completely drench the rest of my gear. I just made sure the top USB cover was closed. No problems encountered and no interruptions in music or communications. I have been caught in the rain a couple of times and headset still works fine. If I got caught in a hard rain I would pop it off the mount and put it in a dry place to be safe. I have used this device a couple of time in the rain and have not had a problem with it. It still works the same as the day I bought it. Hi! Been using mine in some really heavy downpours here on Oahu for almost 2 years with no problems at all. I don't know. I haven't used it in the rain! Otherwise, it's been good. I've ridden in the rain with it many times without issue. Yes, no problem so far. I have an afx fx50 helmet. Will I be able to use the sena smh-5? BEST ANSWER: I don't believe this will work for your helmet as the mic is wired, so it needs somewhere to be mounted with double sided tape. I believe your helmet is open faced, which means there is nowhere to mount the mic. I believe they make a boom mic version, I would recommend going with that one instead. I dont see why not. It has two helmet attachments. 1. goes between cheek pad and outside of helmet and is uses screws to hold it in place 2nd attachment uses double sided tape to place it where ever you want it. Mine is mounted in an Arai Riding with others is transformed into a much more enjoyable experience by the ability to communicate. Yes as long as you get the boom mic and you have a flat piece to clamp the Sena to on the helmet. You need the one with the boom mic to work with our helmet. I have open face and full face helmet. 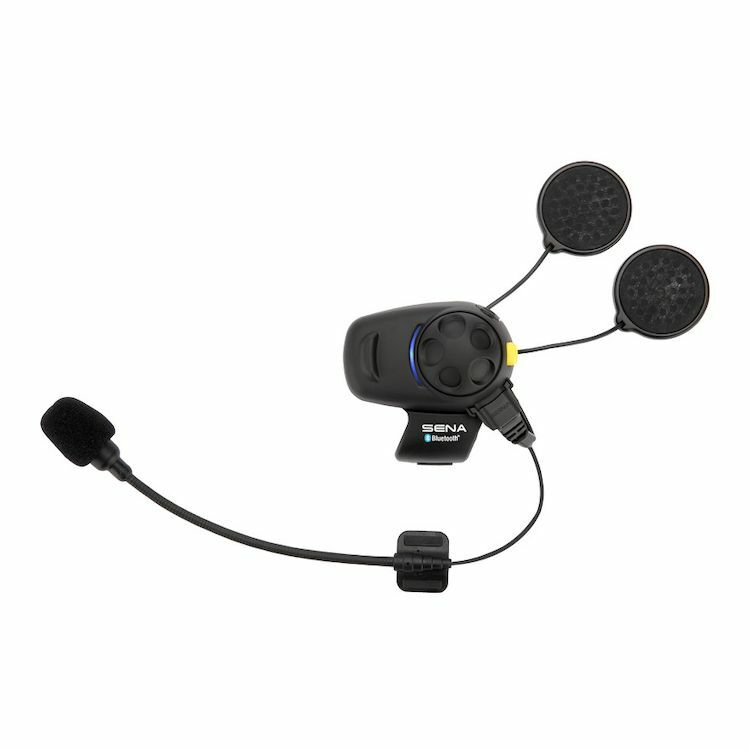 Can I change to boom mic kit for this product? BEST ANSWER: You can install the wired mic set into your full face helmet and order the replacement Sena SMH5/SPH10H-FM boom microphone kit for your open helmet. Yes you can change to the boom mic if you order the boom mic kit for open face helmet I use mine on two different helmets. Sorry. Don't know the answer to that. Just use a sticky mic inside my full face helet. I knew this model have different mics (wired and boom mic) for different type helmet(open face or full face). just wondering i can change to different mic type or not. I have in ear custom earbuds with a simple headphone jack. can they be used with any type of bluetooth device? BEST ANSWER: As far as the SMH5-FM is concerned, I'm pretty sure that your ear buds with the standard jack will not work with it. The connector for the ear buds is completely different. For it to work with your ear buds you would have to wire your ear buds to the existing speaker wires that come with the device. One connector runs the devices microphone and their ear buds. I can tell you though that I have no problem hearing or communicating with my rider with their mic and speakers. I don't even notice the ear buds in my helmet. Nope, this uses a mini USB type plug for the head phones. Will this product fit in a Scorpion Exo 700 helmet w/o major modifications? BEST ANSWER: It certainly should. It went onto my EXO-1100 easily, just took a few minutes and hand tools... No modification required. I bought this product this May and I use it on my Arai helemt, thereafter transfer to my new shoei helmet, both not necessary to modify to fit as the "clamp" for the headset is universal, only concern is to find a good spot to mount the clamp so as to prevent any wearing on the helmet pads. I never use Scorpion helmet before and hope my experience can give you some pointer on this product. One thing for sure is to check if there is any gap between your helmet shell & the cheek pads so that the clamp for the headset can slot in, elase you will need to use the double side tape to mount the headset holder on the helmet (both supplied with the set, but factory recommended to use the clamp). I installed it in an exo 900 very easily. It's not stated whether the 700 has space for the speakers. Check that out. If it does then it is safe to assume that it is designed to accommodate a headset. Good luck! I use mine in an EXO-750 without major problems. The speakers sometimes fold my ears over when I put the helmet on, so I have to stick a finger up there and fix it. Not a big deal to me. Is it possible for a rider and passenger to listen to music (multi-sharing) from one device, i.e., Pandora running on the riders iPhone? BEST ANSWER: Yes, it *is* possible. I've done it on my SMH5, and my SMH10. You can have one music source, and as long as the two Senas are paired, your pillion (or another rider, if close enough) can listen to the same music you are. No, not with this model. This resource sharing is available in the higher models like the SMH20. Is this for two helmets and can rider and passenger listen to two different radio stations? BEST ANSWER: It is meant for one helmet only. If you own two of this, you can install them separately on two helmets and then tune two different fm stations and you can wirelessly communicate between the two.